The Lewisham Hippodrome Theatre was actually located south of Lewisham in the southeast London district of Catford. It was sited on the corner of Rushey Green and Brownhill Road. Opened as a variety theatre on 13th February 1911, it was built for Walter Gibbons and Charles Gulliver and was designed with a flamboyant opulence by noted theatre architect Frank Matcham. Externally, there was a two storey circular domed entrance, which contained the ticket offices. The bulk of the building lay a short distance behind and ran parallel to Brownhill Road. Rising to six storeys in height, it had the name ‘Hippodrome’ enscribed in stonework along the top of the building, facing Rushey Green. Seating inside the auditorium was provided on three levels with capacities of 434 in the pit, 574 in the orchestra stalls, 590 in the circle, 830 in the gallery and 20 in the four boxes on the sides of the proscenium. There were standing spaces for over 1,000. The proscenium was 46 feet wide, the stage was 33 feet deep and 50 feet wide. there were seven dressing rooms and one chorus dressing room. The orchestra pit could accomodate 16, and there was a resident orchestra of 13 musicians. Many famous stars appeared on the Hippodrome’s stage over the years, including; Tommy Handley, Sophie Tucker, The Western Brothers, Jimmy Wheeler and Jessie Mathews. It was taken over by Sydney Bernstein’s chain of Granada Theatres in May 1927, and in September 1927 was converted into a cinema. Renovated and reopened in October 1930 as a live theatre, it closed on 28th March 1931 with a production of "Blue Roses". Alterations were then carried out by architect Cecil Masey, with interior decoration by designer Theodore Komisarjevsky. It re-opened as a cinema on 4th April 1931 and was immediately taken over by Associated British Cinemas(ABC) and by 1933 was operating as a music hall, with films only shown on Sundays. It closed again on 17th June 1933. Taken over by an independent operator, it re-opened as a music hall on 16th October 1933, with a seating capacity of 2,492. It was closed by bomb damage in 1940 and re-opened in 1943. In the early 1950’s the play "Tobacco Road" was staged and the musical "Annie Get Your Gun" starring Peggy Powell and Arthur Clark with a cast of 70 appeared on stage. 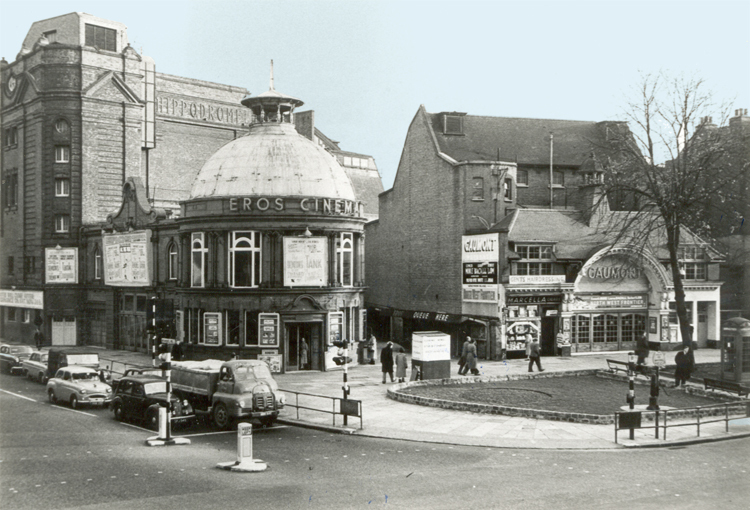 It was closed as a live theatre in 1952 and was taken over by the Hyams Brothers, re-opening as the Eros Cinema on 12th May 1952. Now only 1,500 seats were being used. The Eros Cinema closed on 14th November 1959 with Ken Clark in "Demons of the Swamp"(Attack of the Giant Leeches) and Donato Farretta in "Tank Commandos". The adjacent Gaumont, former Queens Hall Cinema also closed on the same day. Both buildings were demolished in June 1960 and an office block named Eros House was built on the site. Updated link for Eros and Gaumont during closing week. Thanks to all for the Catford posts. I grew up in Catford in the mid-50s to the mid-60s and remember visiting the Eros, the Gaumont and the Plaza/ABC frequently as part of a great childhood there. Loved seeing the photos of the way they were. Getting old now and reminiscing is helped immeasurably by the Internet.